Arachnids are a class (Arachnida) of joint-legged invertebrate animals (arthropods), in the subphylum Chelicerata. Almost all adult arachnids have eight legs, although the front pair of legs in some species has converted to a sensory function, while in other species, different appendages can grow large enough to take on the appearance of extra pairs of legs. The term is derived from the Greek word ἀράχνη (aráchnē), from the myth of the hubristic human weaver Arachne who was turned into a spider. Spiders are the largest order in the class, which also includes scorpions, ticks, mites, harvestmen, and solifuges. In 2019, a molecular phylogenetic study also placed horseshoe crabs in Arachnida. 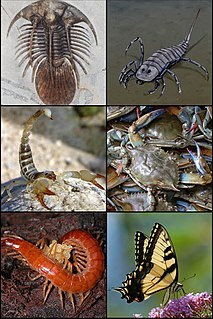 The Acari are a taxon of arachnids that contains mites and ticks. The diversity of the Acari is extraordinary and their fossil history goes back to at least the early Devonian period. Acarologists have proposed a complex set of taxonomic ranks to classify mites. In most modern treatments, the Acari are considered a subclass of the Arachnida and are composed of two or three superorders or orders: Acariformes, Parasitiformes, and Opilioacariformes; the latter is often considered a subgroup within the Parasitiformes. The monophyly of the Acari is open to debate, and the relationships of the acarines to other arachnids is not at all clear. In older treatments, the subgroups of the Acarina were placed at order rank, but as their own subdivisions have become better understood, treating them at the superorder rank is more usual. Galls or cecidia are a kind of swelling growth on the external tissues of plants, fungi, or animals. 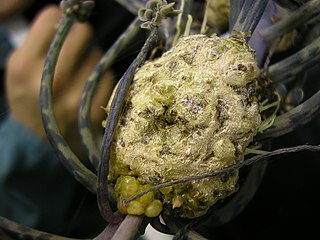 Plant galls are abnormal outgrowths of plant tissues, similar to benign tumors or warts in animals. They can be caused by various parasites, from viruses, fungi and bacteria, to other plants, insects and mites. Plant galls are often highly organized structures and because of this the cause of the gall can often be determined without the actual agent being identified. This applies particularly to some insect and mite plant galls. The study of plant galls is known as cecidology. Ribosomal DNA (rDNA) is a DNA sequence that codes for ribosomal RNA. Ribosomes are assemblies of proteins and rRNA molecules that translate mRNA molecules to produce proteins. As shown in the figure, rDNA of eukaryotes consists of a tandem repeat of a unit segment, an operon, composed of NTS, ETS, 18S, ITS1, 5.8S, ITS2, and 28S tracts. rDNA has another gene, coding for 5S rRNA, located in the genome in most eukaryotes. 5S rDNA is also present in tandem repeats as in Drosophila. In the nucleus, the rDNA region of the chromosome is visualized as a nucleolus which forms expanded chromosomal loops with rDNA. These rDNA regions are also called nucleolus organizer regions, as they give rise to the nucleolus. In the human genome there are 5 chromosomes with nucleolus organizer regions: the acrocentric chromosomes 13 (RNR1), 14 (RNR2), 15 (RNR3), 21 (RNR4) and 22 (RNR5). In Bacteria, Archaea and chloroplasts the rRNA is composed of different (smaller) units, the large (23S) ribosomal RNA, 16S ribosomal RNA and 5S rRNA. The 16S rRNA is widely used for phylogenetic studies. Internal transcribed spacer (ITS) refers to the spacer DNA situated between the small-subunit ribosomal RNA (rRNA) and large-subunit rRNA genes in the chromosome or the corresponding transcribed region in the polycistronic rRNA precursor transcript. The Holothyrida are a small order of mites in the superorder Parasitiformes. No fossils are known. With body lengths of more than 2 mm they are relatively large mites, with a heavily sclerotized body. They mainly feed on the body fluids of dead arthropods. This was possibly the common way of feeding for ticks before they adapted for feeding on the blood of live animals. Mesostigmata is an order of mites belonging to the Parasitiformes. Unlike most members of that group, many of these mites are not parasitic but free-living and predatory. They can be recognized by the single pair of spiracles positioned laterally on the body. The Opiliones are an order of arachnids colloquially known as harvestmen, harvesters, or daddy longlegs. As of April 2017, over 6,650 species of harvestmen have been discovered worldwide, although the total number of extant species may exceed 10,000. The order Opiliones includes five suborders: Cyphophthalmi, Eupnoi, Dyspnoi, Laniatores, and Tetrophthalmi, which were named in 2014. Parasitiformes is an order of Acari. An alternative name is Anactinotrichida. Parasitiformes is one of two groups (orders) in Acari, the other being Acariformes (Actinotrichida). Russet mite, Aceria anthocoptes is found on the invasive weed Cirsium arvense , the Canada thistle, across the world. It may be usable as a biological pest control agent for this weed. Varroa destructor is an external parasitic mite that attacks the honey bees Apis cerana and Apis mellifera. The disease caused by the mites is called varroosis. Varroa is a genus of parasitic mites associated with honey bees, placed in its own family, Varroidae. The genus was named for Marcus Terentius Varro, a Roman scholar and beekeeper. The condition of a honeybee colony being infested with Varroa mites is called varroosis. Varroa jacobsoni is a species of mite that parasitises Apis cerana. The more damaging Varroa destructor was previously included under the name V. jacobsoni, but the two species can be separated on the basis of the DNA sequence of the cytochrome oxidase I gene in the mitochondrial DNA. Acariasis is an infestation with mites. Oribatida, also known as moss mites or beetle mites, are an order of mites, in the "chewing Acariformes" clade Sarcoptiformes. They range in size from 0.2 to 1.4 millimetres. Trombiculidae are a family of mites. The best known of the Trombiculidae are the chiggers. The two widely recognized definitions of "chigger" are the scientific and the common, the latter of which can be found in English and medical dictionaries. According to most dictionaries, the several species of Trombiculidae that bite their host in their larval stage and cause "intense irritation" or "a wheal, usually with severe itching and dermatitis", are called chiggers. The scientific definition seemingly includes many more, but not all species of Trombiculidae. Acomatacarus is a genus of mites in the family Trombiculidae. The larvae are parasitic. Species are called also chiggers, scrub itch-mite. The genus includes Acomatacarus arizonensis (lizards), Acomatacarus australiensis, Acomatacarus galli. Mites are small crawling animals related to ticks and spiders. 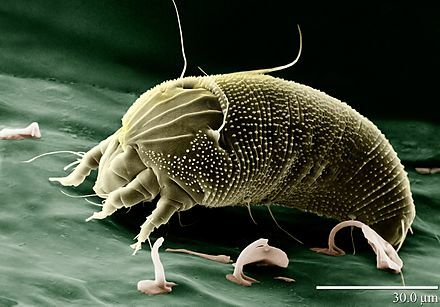 Most mites are free-living and harmless. Other mites are parasitic, and those that infest livestock animals cause many diseases that are widespread, reduce production and profit for farmers, and are expensive to control. Galumna pseudokhoii is a species of mite first found in Cát Tiên National Park, Vietnam, in dark loam in a Lagerstroemia forest. 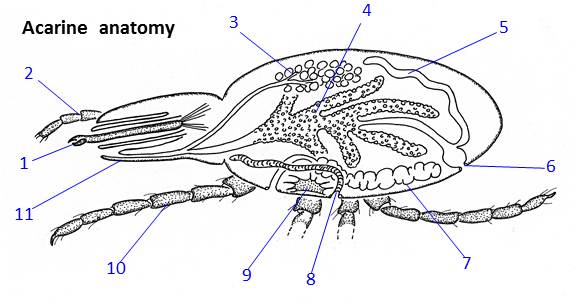 This species is very similar in the location and morphology of notogastral areae porosae, rostral morphology, lamellar and interlamellar setae, lamellar lines locations, and incomplete dorsosejugal suture to Galumna khoii, differing in body size, sensilli morphology, and the number of genital setae on the anterior parts of its genital plates. Pergalumna indistincta is a species of mite first found in Cát Tiên National Park, Vietnam, in dark loam in a Lagerstroemia forest. This species is similar in notogastral areae porosae, punctate body surfaces, prodorsal setae morphology, and dorsosejugal suture, to Pergalumna amorpha, differing in body size and the development of its adanal setae. ↑ Dhooria, Manjit Singh (2016). Fundamentals of Applied Acarology. Springer. p. 176. ISBN 978-981-10-1594-6. ↑ Gerald W. Krantz; D. E. Walter, eds. (2009). A Manual of Acarology (3rd ed.). Texas Tech University Press. ISBN 978-0-89672-620-8. ↑ de la Fuente, José (2003). "The fossil record and the origin of ticks (Acari: Parasitiformes: Ixodida)". Experimental and Applied Acarology. 29 (3/4): 331–344. doi:10.1023/A:1025824702816. ↑ Bernini, F.; Carnevale, G.; Bagnoli, G.; Stouge, S. (2002). "An Early Ordovician oribatid mite (Acari: Oribatida) from the island of Oland, Sweden". In Bernini, F.; Nannelli, R.; Nuzaci, G.; de Lillo, E. Acarid Phylogeny and Evolution: Adaptation in Mites and Ticks. Proceedings of the IV Symposium of the European Association of Acarologists. Springer. pp. 45–47. ISBN 978-94-017-0611-7. ↑ Klompen, Hans; Grimaldi, David (2001). 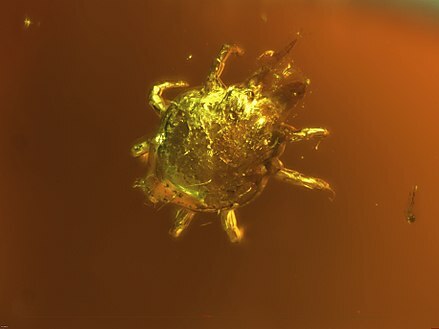 "First Mesozoic Record of a Parasitiform Mite: a Larval Argasid Tick in Cretaceous Amber (Acari: Ixodida: Argasidae)". Annals of the Entomological Society of America. 94 (1): 10–15. doi:10.1603/0013-8746(2001)094[0010:FMROAP]2.0.CO;2. ↑ Dunlop, Jason A.; Wunderlich, Jörg; Poinar, George O. (2007). "The first fossil opilioacariform mite (Acari: Opilioacariformes) and the first Baltic amber camel spider (Solifugae)". Transactions of the Royal Society of Edinburgh: Earth Sciences. 94 (3): 261–273. doi:10.1017/S0263593300000663. ↑ Barker, S.C. & Murrell, A. (2004). "Systematics and evolution of ticks with a list of valid genus and species names". Parasitology. 129 (7): S15–S36. doi:10.1017/S0031182004005207. ↑ Sanggaard, Kristian W.; Bechsgaard, Jesper S.; Fang, Xiaodong (6 May 2014). "Spider genomes provide insight into composition and evolution of venom and silk". Nature Communications. 5: 3765. Bibcode:2014NatCo...5E3765S. doi:10.1038/ncomms4765. PMC 4273655 . PMID 24801114. ↑ Dabert, Miroslawa; Witalinski, Wojciech; Kazmierski, Andrzej; Olszanowski, Ziemowit; Dabert, Jacek (2010). "Molecular phylogeny of acariform mites (Acari, Arachnida): Strong conflict between phylogenetic signal and long-branch attraction artifacts". Molecular Phylogenetics and Evolution. 56 (1): 222–241. doi:10.1016/j.ympev.2009.12.020. PMID 20060051. 1 2 3 4 5 6 7 Ruppert, Edward E.; Fox, Richard, S.; Barnes, Robert D. (2004). Invertebrate Zoology, 7th edition. Cengage Learning. pp. 590–595. ISBN 978-81-315-0104-7. ↑ Balashov, Y.S. (1972). 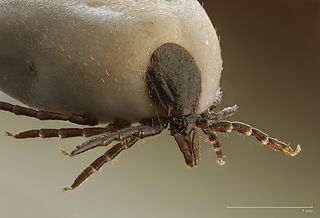 Bloodsucking Ticks - Vectors of Diseases of Man and Animals. Miscellaneous Publications of the Entomological Society of America, 8: 161–376. ↑ Yong, Ed (27 August 2014). "You Almost Certainly Have Mites On Your Face". 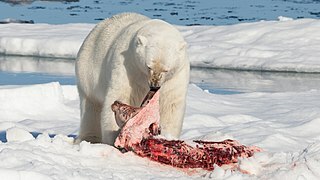 National Geographic. Retrieved 23 November 2017. ↑ Biljana D. Magud; Ljubiša Ž. Stanisavljević; Radmila U. Petanović (2007). "Morphological variation in different populations of Aceria anthocoptes (Acari: Eriophyoidea) associated with the Canada thistle, Cirsium arvense, in Serbia". Experimental and Applied Acarology . 42 (3): 173–183. doi:10.1007/s10493-007-9085-y. PMID 17611806. ↑ Arroyo, J.; Keith, A.M.; Schmidt, O.; Bolger, T. (2013). "Mite abundance and richness in an Irish survey of soil biodiversith with comments on some newly recorded species". Ir Nat. J. 33: 19–27. 1 2 Jeppson, L.R. ; Keifer, Hartford H.; Baker, Edward William (1975). Mites Injurious to Economic Plants. University of California Press. pp. 1–3. ISBN 978-0-520-02381-9. ↑ R. B. Halliday, B. M. OConnor & A. S. Baker (2000). "Global Diversity of Mites". In Peter H. Raven; Tania Williams. Nature and human society: the quest for a sustainable world : proceedings of the 1997 Forum on Biodiversity. National Academies. pp. 192–212. ↑ Michael Heethoff & Lars Koerner (2007). "Small but powerful – the oribatid mite Archegozetes longisetosus Aoki (Acari, Oribatida) produces disproportionate high forces". Journal of Experimental Biology . 210 (17): 3036–3042. doi:10.1242/jeb.008276. PMID 17704078. ↑ Federation of American Societies for Experimental Biology (FASEB) (27 April 2014). "Mite sets new record as world's fastest land animal". Featured Research. ScienceDaily. Retrieved 23 November 2017. ↑ Erickson, Jim (2013-03-08). 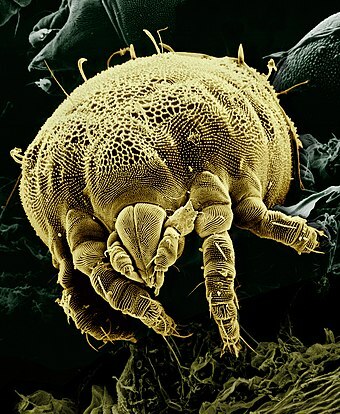 "Genetic study of house dust mites demonstrates reversible evolution". Michigan News. Retrieved 31 May 2014. ↑ Schwarz, Herbert Ferlando; Louise, Bacon, Annette. "Stingless bees (Meliponidae) of the Western Hemisphere : Lestrimelitta and the following subgenera of Trigona : Trigona, Paratrigona, Schwarziana, Parapartamona, Cephalotrigona, Oxytrigona, Scaura, and Mourella. Bulletin of the AMNH ; v. 90". digitallibrary.amnh.org. Retrieved 2015-11-05. ↑ Berghoff, S.M. ; Wurst, E.; Ebermann, E.; Sendova-Franks, A.A.B. ; Rettenmeyer, C.W. ; Franks, N.R. (2009). "Symbionts of societies that fission: Mites as guests or parasites of army ants". Ecological Entomology. 34 (6): 684. doi:10.1111/j.1365-2311.2009.01125.x. ↑ Fenemore, P.G. (2016). Plant Pests and Their Control. Elsevier. p. 112. ISBN 978-1-4831-8286-5. 1 2 Hall, John C.; Hall, Brian J. (2009). Skin Infections: Diagnosis and Treatment. Cambridge University Press. p. 260. ISBN 978-0-521-89729-7. 1 2 Capinera, John L. (2008). Encyclopedia of Entomology. Springer Science & Business Media. p. 2425. ISBN 978-1-4020-6242-1. ↑ Schulze, Keith E.; Cohen, Philip R. (1994). "Dove-associated gamasoidosis: A case of avian mite dermatitis". Journal of the American Academy of Dermatology. 30 (2): 278–280. doi:10.1016/S0190-9622(08)81930-5. ISSN 0190-9622. ↑ Theis, Jerold (1981-06-01). "Tropical Rat Mite Dermatitis". Archives of Dermatology. 117 (6): 341–3. doi:10.1001/archderm.1981.01650060031018. ISSN 0003-987X. PMID 7247425. 1 2 James, William D.; Berger, Timothy G. (2006). Andrews' Diseases of the Skin: Clinical Dermatology. Saunders Elsevier. p. 454. ISBN 978-0-7216-2921-6. ↑ Diaz, J. H. (2010). "Endemic mite-transmitted dermatoses and infectious diseases in the South". The Journal of the Louisiana State Medical Society. 162 (3): 140–145, 147–149. PMID 20666166. ↑ Paul Klenerman; Brian Lipworth. 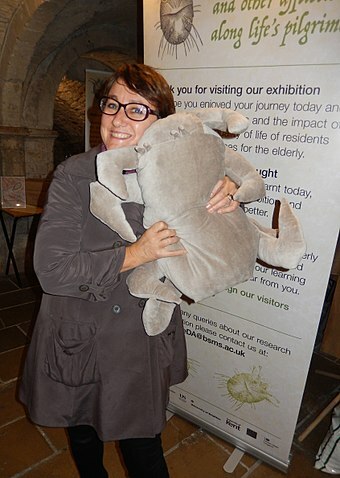 "House dust mite allergy". NetDoctor. Retrieved February 20, 2008. ↑ Van den Broek, A. (2000). "Cutaneous and systemic responses during primary and challenge infestations of sheep with the sheep scab mite, Psoroptes ovis". Parasite Immunology. 22 (8): 407–414. doi:10.1046/j.1365-3024.2000.00318.x. ↑ Ernesto Guzmán-Novoa; Leslie Eccles; Yireli Calvete; Janine Mcgowan; Paul G. Kelly & Adriana Correa-Benítez (2009). "Varroa destructor is the main culprit for the death and reduced populations of overwintered honey bee (Apis mellifera) colonies in Ontario, Canada" (PDF). Apidologie . 41 (4): 443–450. doi:10.1051/apido/2009076. ↑ Benjamin, Alison (2 May 2010). "Fears for crops as shock figures from America show scale of bee catastrophe". The Guardian. London. 1 2 3 Marren, Peter; Mabey, Richard (2010). Bugs Britannica. Chatto & Windus. pp. 122–125. ISBN 978-0-7011-8180-2.